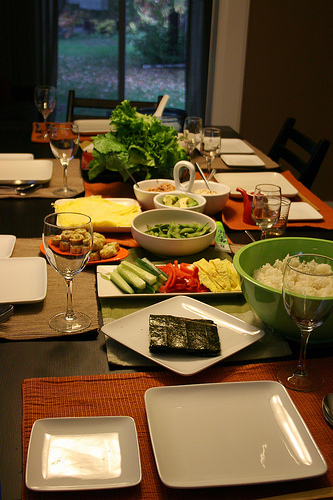 In Japan, temaki sushi is a popular family dinner or home party. Temaki literally means hand-roll, and we usually call the sushi style in one word “temaki-zushi,” and refer “make-your-own” sushi party. It is actually a great party idea because it is very easy to prepare. You just throw sushi rice, fillings, and nori seaweed on a table, so that everyone can make their sushi with whatever they like. In the video below, a lady (with a dog) shows how to prepare for a temaki sushi party. She prepares the sushi rice with ginger but it is because the most fillings are fresh fish. 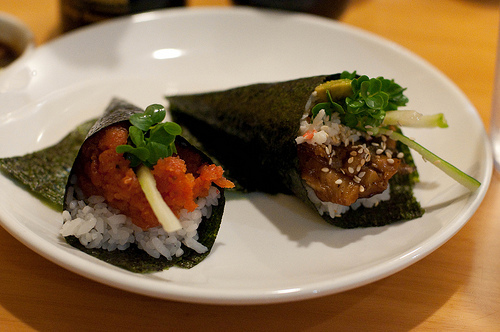 Plain sushi rice is more common and preferable for other kind of fillings. To make plain sushi rice, this video will be helpful. The fillings that can be used besides fresh fish for temaki sushi are canned tuna, avocado, imitation crab, canned crab, corn with mayonnaise, smoked salmon (good with cream cheese), thin egg strip, cucumber, lettuce, tempura, teriyaki chicken, and natto. Cut the ingredients into sticks, which makes easier to wrap. In temaki sushi, the filling is wrapped diagonally like an ice cream cone. You can make sushi with lettuce instead of nori seaweed.